What’s your favorite Christmas-ish song? Let’s also tip the hat to songs that simply use Christmas as a setting. There’s no real attempt to evoke the mood or the memory of the holiday. It’s just the day when These Things Happened. I have two favorite Christmas songs. One secular, one very doubleplus not. The first tells a story of an event on Christmas Eve; the second talks about something that happened on Christmas Day. Both have the kind of lyrics that demand to be printed out and read as poetry. There never has been, nor will there ever be, a better piece of music than this. I’m not saying that Bach’s Brandenburg Concertos weren’t as good; I’m simply saying that when you compare it to this epic song about regret, loss, and longing you must ultimately conclude that these are two very different pieces of music. I don’t think the thought “I’m someplace where I really don’t want to be” ever penetrates so strongly as when it hits you on Christmas Eve. And the root cause isn’t always something as harmless as “Uncle Gob has cornered me and he insists that it’s my duty as a concerned parent to buy one of his $1200 water filters,” either. You can always stop payment on the check as soon as you can get outside and find a signal on your iPhone. But when it appears to you that your life has been a flawless sequence of self-destructive choices and that your remaining decisions have collapsed down to “live” or “die”…well, not even the end of “A Charlie Brown Christmas” or a tube of raw Pillsbury Sugar Cookie Dough can break you free. That’s the spot that the narrator of “Fairytale of New York” is in. It’s hard not to take pity on someone who’s in jail on a night like this but still, it’s hard to actually root for him, either. But you’re keenly interested. After I hear this song I almost always visit the lyrics. I want to sift them for more clues to what’s happening with this guy. He’s a drunk and a gambler and probably an addict. Is he learning anything tonight? Or is he distracting himself from his situation with delusions about a past relationship? Is he giving up? Does he have any hope for himself and the future? He spends part of the song reflecting on a time when he seemed to have the world at his feet. Do those memories encourage him, or do they only drive him deeper into depression? And whatever happened to the woman? Clearly, she’s out of his life. That must have been a good thing for both of them. Is she spending that same day in her own version of the drunk tank? Or has she found some answers that continue to elude her former partner? Would she be flattered to know that here, at his lowest point, he consoled himself with thoughts of her? Would she pity him? It’s a very malleable story. You could just as easily interpret the lyrics to mean that he’d made it out, found a new source of hope, and from the safety of a better life he’s thinking back to the day when he hit rock-bottom and the only cheer he could find was in a ruined relationship. That’s the hallmark of a truly great song. It was one specific thing when it was written and recorded but its final character and flavor is only assembled and defined by the palate of the person who hears it. There’ve been a bunch of viral Internet creations where someone takes a self-portrait with identical composition and lighting every day of his or her life for years. That suddenly seems boring. The only thing the series will teach you about yourself is “You got progressively older and you tried out only two or three new hairstyles.” But what if you were to write about the same song — particularly one as potent as “Fairytale of New York” — on the same day every year? What would the next ten to twenty annual essays reveal about the path you’ve taken through life? Changes in weight, beards and hairstyles are easy to spot. Your assessment of yourself, the world, and how the first thing relates to the second thing can only be tracked through close examination. I would dare say that the results could be far more revealing and mortifying than a temporary distraction into the world of mullets. 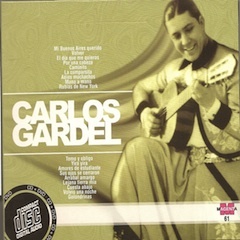 Listen to “Fairytale Of New York” on Amazon MP3. For the record, I’m headed out to the first of about four or five different parties and gatherings over the next 48 hours. At the moment, I suspect that I’ll look back on this blog post and the only source of embarrassment will be the fact that back in 2010, I was using Amazon Associates links to get little kickbacks from my readers’ Amazon purchases. I might tsk-tsk and think “How cheap and exploitative!” early on. But then I’d remember the gorilla costume I ordered with the resulting Gift credits in 2011. And then every last lingering regret will be instantly dismissed. But I hesitate to call it a mere “novelty song.” Anyone who owns a notebook with a built-in microphone can record a “novelty” version of the theme from “The Odd Couple” in which the melody is primarily articulated via hand farts. It’s not exactly hard work is it? I want to show this song some proper respect. We should at least translate “novelty song” into…I dunno. French or something? Oh, fab. Yes, let’s go with that. This is no mere novelty song: it’s a true chanson de fantaisie. I have to imagine that when they finally figured out (on their very last day in the studio) that the thumpy-thumpy-thumpy beat of “Frosty The Snowman” would work quite well with “Getting Better All The Time” everybody leaped up and threw papers in the air and hugged each other and lit cigars, and overall they behaved like the Mission Control people did when the crew of Apollo 13 splashed down safely. Not all of the songs on this album are gold. Most of them will have exactly the desired effect on the people at your party, shopping at your store, or riding in your car. They’ll instantly recognize the holiday classic. Their brains will want to click the song into the background, but then they’ll sort of recognize something else that’s going on. And then watch and behold, as their expressions mirror those of a Final Jeopardy contestant who was about to write “What is the Po?” but who now can’t remember if that’s an Asian river. A tip of the hat to my BFF John. His annual mix tape (now CD) is as integral to the Ihnatko Christmas as the airing of that Hershey’s Kisses commercial where the candies are rung like tiny bells. Which is to say: completely. “St. 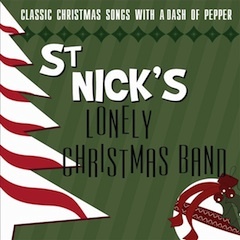 Nick’s Lonely Christmas Band” was one of the 12 groups represented on this year’s 24-track selection of holiday wonderment. 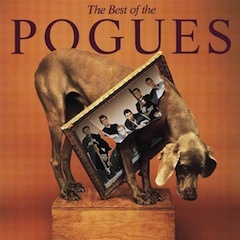 Listen to “Santa Claus Is Coming To Town” on Amazon MP3. As always, my Amazon Associates ID is embedded in that link. Any purchases you make after clicking it will result in a small but valued kickback in the form of Amazon gift credits. I shall spend them lavishly, selfishly, and foolishly. You’re all very correct to think so highly of me, sensation-seekers. Not only do I have an unfailing moral compass, but I often subject it to abnormal magnetic fields just to test its unfailing-moral-compassness, so that I can then make adjustments, as necessary. Witness this selection. Also witness the fact that the link goes not to the Amazon MP3 Store, but to iTunes. See, there was a differrent track that I wanted to recommend, but it hasn’t been formally published anywhere (more on this, anon). So I went off looking for something similar that I liked just as much, and I found this track by Rush Coil on iTunes. Cool. Then I went to Amazon.com for the link. Alas, they don’t have it. But no. I assure you that the primary purpose of here is to share music that I actually, genuinely like. And the prime mover for choosing Amazon instead of iTunes isn’t the kickbacks (though they’re very, very nice. It’s because I know that anyone can click an Amazon link and hear the music sample and buy it without having to download and install a separate app. If it were an iTunes link, you could only do two of those three things. Listen to “Carol Of The Bells” on the iTunes Store. Allow me to close off this meta portion of the post by confirming that my strength is as the strength of ten men, for my heart is pure. Onward to the song itself. It’s been a slow build, but “chiptune” music (songs that sound as though they were being played by the soundchips in vintage game consoles) has steadily made its way from Novelty to Meme to a legitimate, established genre. And I can honestly say that I like this version of “Carol Of The Bells” on its own merits, not because it’s such an odd way to arrange and record a tune. I guess the lesson is that “on its own merits” is a very, very complicated thing, even with more traditional music. Pandora.com has got it exactly right: there’s a molecular profile to every song that links it backwards to every song you liked before you heard this one, and forwards to every song you hear after it. And the metrics of this phenomenon go beyond tempo, instrumentation, and vocals. There’s also a sense of time and place. “American Graffiti” was the first big pop-culture phenomenon that underscored how powerful the phrase “Gosh, this is just like the stuff I liked when I was a kid” is in influencing what we like as adults. It’s true that your favorite songs in high school and college will almost always remain your favorites as you enter your thirties and forties and fifties. They have their own merits, yes, but they’re enmeshed with other pleasant memories, like a wad of gum in a shag carpet. This sort of reaction isn’t quite as mainstream as “This song was playing on the radio the night I first made out with the woman who would one day become my wife.” But “Oh, man, this is just like the game that I spent all summer trying to beat in high school!” works, too. Let’s not get mired in that junk, though. I like chiptune music because by necessity, it launches a very clean and no-nonsense attack on the melody. It’s why a four-piece jazz combo can accomplish things with a song that a spongy 40-piece orchestra can’t. Every instrument and every melodic line is front-and-center and there’s no room for extraneous flourishes. I mean, I’d love to get a hold of the soundtrack to the “Batman” Game Boy game. I long ago gave my Game Boy and all of its carts to a nephew (your correspondent can be quite a dope). But a vid of this game is up on YouTube. The music is a little sparser than I remember it, but yup: I’d definitely buy this track if it were available anywhere. 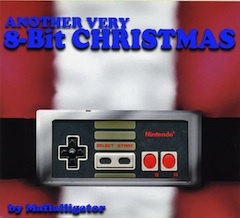 The bad news: no, you can’t buy “A Very 8-Bit Christmas” on iTunes or Amazon. The good news: it’s a free download, according to the descriptions on Something Awful. The bad news again: …but there’s no new release this year. And the older releases are old enough that they’ve aged back behind Something Awful paywall. So I’m in kind of a pickle, here. And not the electronic yodeling kind. I’ve located other download links for the albums. But are they legit? I dunno. I’m going to post one set of links here, because as near as I can tell the content is behind the Something Awful paywall only as a “it costs us money to host these files” sort of thing, and not because access to these tracks is an exclusive perq of Something Awful membership. I’ve also been unable to find any links to Mr. Mafiassassin’s own site. 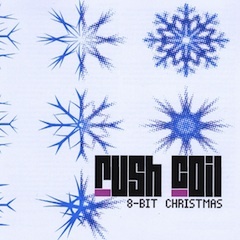 Also: this particular page-o-links contains a whole list of chiptune Christmas music collections, not just the Very 8-Bit releases. The Page Of Chiptune Christmas Links In Question. Yeah, there are plenty of winners, here. Mafialligator has real skills as an arranger. He’s not just copying down notes from a simplified set of sheet music. These are true, polyphonic performances. 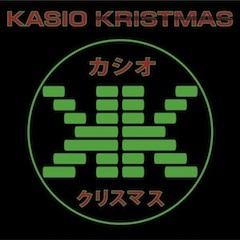 These tracks get plenty of airplay in my house during the holiday season. 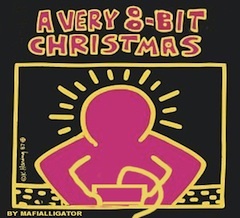 When I set up and decorated my Christmas tree this year, I was listening exclusively to an “8-Bit Christmas” playlist. This link is embedded with my Amazon Associates code. And after you click it, all of your Amazon purchases will result in a commensurate percentage of the final tally coming back to me in the form of gift credits. The fact that I was well aware of the existence of this consumer item indicates the fine, fine ends to which I will be applying these credits. Here’s a song with real crossover appeal. And not that weak kind of crossover either, where a longtime fan of a quirky, iconoclastic performer eagerly buys her first mainstream release and is bewildered to find that all of a sudden, she’s covering both Ann Murray songs and the Misfits tattoo on her forehead. Nope, I mean “crossover” in the sense that this is a Christmas song arranged like a spooky Halloween tune. You know that scene in “The Grinch Who Stole Christmas” where the Grinch snips the pieces for his Santa suit out of a set of red curtains? Okay: substitute “the flayed skin of a still-living human victim” for “curtains” and you’ve got the idea of this version. Well, close enough, anyway. It provides excellent value for money in that you can start playing this in mid-October and not give it a rest for two whole months. I’ve suddenly realized that the same could be true of a Grinch lawn ornament. It just seems like too much bother to decorate the house for just a couple of weeks, to say nothing of the expense and all of the storage problems. I could certainly get behind a decoration that you can keep on your lawn for a quarter of the year. It wouldn’t be perfect. I’d still have to stow the Grinch’s Santa suit until “Gosh, you still have your Halloween decorations up?” transitions to “Gosh, you’re already putting up your Christmas decorations?” But if you’re willing to stretch it all the way to “When are you going to take those Christmas decorations down, Andy?” I could be covered through February. 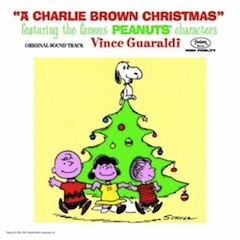 Listen to “You’re A Mean One Mr. Grinch” on Amazon MP3. As always, Amazon music links on this site are embedded with my Amazon Associates code. Everything you purchase after clicking it results in my receiving a small kickback in the form of Amazon gift credits. I assure you: they shall be spent joyously and foolishly on fun things. How many Christmas songs can there be, do you reckon? And I’m not throwing my hands in the air and whining that there are too damn many of them. I’m saying that there seems to be a fixed number of Christmas songs that we’re willing to accept, in the same sense that in baseball, you’re limited to a 25-man active roster and a 40 man expanded roster. And whenever there’s a hot new left-hander whom you want to bring up from the minors, you’re forced to send a broken-down left fielder back to Indiana to work at his cousin’s Volkswagen dealership or perhaps testify at some kind of hearing. Is it…fifty songs? Whatever. There’s definitely a ceiling to it. It’s not as though every year, we become aware of more and more Christmas songs. “The Hanukkah Song” explodes and from that point on, some old standard that was scrabbling for survival gets dropped from our consciousness, never to return. All I can say is that it’s a good system. I don’t think anyone would deny that when “Rudolph, The Red-Nosed Reindeer” finally pushed “Stuff An A-Bomb In Hitler’s Stocking, That Nasty Nazi Rat” off into oblivion in 1949, it was a long time coming and a positive step forward in healing the wounds of war. 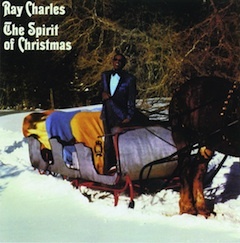 What are the chances of a song like “The Spirit Of Christmas” becoming a Holiday standard? It’s forced to knock timidly on the back door and hope that this is the year when we’re all finally sick of “Grandma Got Run Over By A Reindeer.” I think I heard it twenty times before I actually bought it. I bet you’ve heard it, too. I think it’s even possible that you’ll be able to place it, once you hear the sample. Yes, it’s from the “National Lampoon’s Christmas Vacation” soundtrack. You hear a snippet of it while Clark is trapped in the attic, and is watching 30-year-old home movies. It’s a lovely, (mostly) secular tune that underscores the basic concept that whether you’re a Christian or not, it’s nice that there’s this spot on the calendar during which people are at least supposed to try not to act so much like d***s.
And it’s from Ray Charles. He’s like Johnny Cash in that his performance makes any song hard to date. What a sneaky tactic. This song is good enough to displace any of the lesser tunes on the Christmas Roster. I bet the composers were hoping that everyone would just assume that it was already a classic. I’m willing to forgive. It’s quite a solid tune. I’m curious about when it was written, though. The first name on the list of contributing songwriters is Mable John, who has a decades-spanning history with Ray Charles (as a Raelette and then as the director of these same Raelettes). Was it written especially for Ray Charles, maybe? It sure sounds like it. There are a handful of other versions of “The Spirit Of Christmas” rolling around but none of them truly distinguish themselves. It’s a great tune for the “cooldown” phase of the holiday. Its tone is a little too solemn to be heard over the din of a Christmas party or the unwrapping of presents, but it’s still not the best choice for the “C’mon Everyone…Let’s Take A Moment To Be, You Know, Kind Of Solemn And Stuff, Okay?” part of the proceedings. But it’s the perfect thing to send to the AirPlay speakers in the living room while you contemplate a room full of torn wrapping paper and decide to have another gingerbread donut instead of cleaning it up right away. Listen to “That Spirit Of Christmas” on Amazon MP3. We’re at Kringle Minus 6, people! Clearly it’s time for me to stop diving deep into the back-catalogues and give up any attempt to make myself seem like the Ahmet Ertegun of my generation. Although yes, admittedly, inserting a reference to one of the 20th century’s seminal discoverers and promoters of musical talent is definitely a nod towards hipness. It’s a fair cop. But look, we can’t waste precious minutes arguing over my desperate need to mask my own straight-from-squaresville tastes! We’ve got limited time left to talk about Christmas songs! So screw it: I’m going obvious. Yes, it’s That Song We All Love from That Christmas Special We Can’t Even Pretend We’re Sick Of. Don’t think I don’t know what just happened. You’re on the Internet and you’ve just read a blog post in which the author has made a definite statement of some kind. You’re like a largemouth bass who’s just seen a jelly worm at the end of a Red Devil spoon lure splash down in front of you. You just have to snap at it, even as your rational brain says “No good can possibly come of this.” You’ve already clicked the “Reply” button and pasted in a mockingly dismissive LOLcat that you encountered on a gaming board a few days ago, haven’t you? Fine. I know you have to keep proving to yourself that you ride at the gates of dawn and that your likes and dislikes cannot be predicted by any Earthly king. I suppose that this video clip does absolutely nothing for you, then. That’s not a slam against the song, mind you. I mean, dammit, this song works. It seems as though the only way you could ruin it is by trying to turn it into a showcase of anybody’s talents as a singer, arranger, or producer. Would any singer — even an American Idol finalist — accept and implement the direction “Don’t think. Just sing”? Am I starting to get mired in nostalgia, here? God, I hope not. I’m at least thirty years too young and have been in several wars too few to get nostalgic about anything. And yet this song puts me right back in my parents’ living room, having counted down the days to the Charlie Brown Christmas airing for two weeks. It also puts me right back on a stage at the far end of a middle-school gym, standing on a folding metal riser, trying to pick out my grandparents in the audience while the music teacher gets more and more frustrated by her ability to make all of us focus, and getting closer and closer to losing it right there in front of the principal. Listen to “Christmastime Is Here” on the Amazon MP3 Store. Continuing another Beloved Holiday Tradition, the above link is embedded with my Amazon Associates code. If you click it, all of the purchases you make during that session will result in my receiving a small kickback in the form of Amazon Gift Credits. I promise to spend them joyously and foolishly. Maybe the most sophisticated version of the Turing Test for any given technology is actually the simple question “Is it capable of helping us and screwing us at the same time?” Then and only then can we say that a machine is truly Human. “And I Wonder?” is one of the songs I bookmarked last night on Pandora while working away from the house. It’s good stuff: peppy, with a ska/rocksteady sort of vibe. I also have a lot of affection for music that clearly wasn’t beaten to death by heavyhanded production. I could believe that this group just set up some mismatched microphones in the apartment of whichever band member had the most-sympathetic neighbors and then they recorded it on someone’s MacBook in just three takes. When I got home, I looked through everything I’d bookmarked and I bought the track after another listen. This morning, I did a quick Spotlight search on it, just so I could drag it into a couple of different playlists, and that’s when I saw the other copy that I’d bought from another store a couple of years ago. See what I mean? In the old, analog days I didn’t have anything like Pandora, which can extrapolate an endless stream of new music that’s likely to please me, after I name just a single artist as a starting point. Thank you, digital music! But back in the Nineties, by the time I wound up at a CD store I’d forgotten all about that great song I’d heard on the radio or at a party. I was unlikely to buy anything at all. And I certainly couldn’t buy something so quickly that I wouldn’t realize that I already owned it. So go to hell, digital music! Pandora offers discoverability and vocabulary. You’ve sampled “And I Wonder?” and you liked it. It occurs to you that a lot of the music you like is kind of similar. How do you Google for “music has kind of the same thing going on as this other song right here?” You have no idea how to describe it. So if you memorize that list and then walk into a city record store and tell the clerk “I’m looking for music with ska roots, a subtle use of paired vocal harmony, mild rhythmic syncopation…” you’ll definitely not come across looking like some hick who buys most of his songs from QVC in the form of windup music boxes shaped like porcelain clowns. 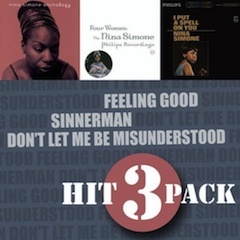 Listen to “And I Wonder?” on the Amazon MP3 Store. As always, this link is tagged with my Amazon Associates ID. Click it, and any purchases you make during that session will result in my getting a small kickback in the form of Amazon Gift Credits. I swear to God that I won’t spend those credits on anything sensible. I don’t want to get into the exhausting argument “Which is the greatest musical ever made: ‘The Band Wagon’ or ‘Singin’ In The Rain’?” It’s tiresome and unproductive and it misses the entire point of MGM’s Golden Age. The point being that the only reason why “Singin’ In The Rain” is part of that question to begin with is to provide a framework from which to further clarify your understanding of why “The Band Wagon” is a true masterpiece. Let’s say you’re having just a Biblically crummy day. And I mean “Old Testament” bible, not the huggy-lovey New Testament kind. The one where you’re not sure exactly how you’ve come to piss off God so badly, but if you have to drag your son and a big knife to the top of a mountain to make Him leave you alone…well, that’s just one fewer Christmas present to buy, isn’t it? Rather, if Christ had been born before then, there’d be one less present to buy. Wait, I forgot: Holy Trinity. So, the part of God that was going to have His first birthday in a thousand years or so was already there. And He would have been all-knowing, so even pre-birth, he’d be expecting a present on December 25. Cripes. Can you understand why people back then got so mental about figuring out God’s laws? But I digress. “Shine On Your Shoes” is one possible answer to the “Crummy Day” problem. You can play this song and it’ll get you bouncing in your seat and possibly — if you’re absolutely sure you’re alone in the room and that nobody can see through the windows — dancing across the floor. You can even go out and get a shoeshine. Yeah, it’s silly. But there’s some wisdom, there. I’ve always liked that scene from “The Hustler,” where Fast Eddie is shooting pool against Minnesota Fats in a marathon match for huge stakes. After hours of play, Fats is completely on the ropes and close to defeat. So he calls for a break. He goes to the men’s room where he puts on a fresh shirt, washes his face and hands, spritzes on a little cologne, and then steps back to the table. “Fast Eddie,” he beams, “Let’s shoot some pool.” You know that he’s going to come back with the win and of course, that’s exactly what happens. Yeah. I’m having a hideously bad week. A song like this one reminds me that while you can’t completely control the events that are contributing to a bad mood…your moods are at least 90% voluntary. A warm-reboot can work wonders and something as simple as a fresh shirt or a $10 shoeshine can push that button for you. Just now, for example, I’ve fixed myself a bowl of oatmeal with three strips of chopped bacon in it. I can’t tell you what the key to happiness is, but the keyhole appears to be bacon-shaped. You’re free to conclude whatever you wish from that. Anyway. Back to the movie itself. So many of these MGM musicals seem to have made very…odd…choices in music. “Why did they even pick some of these weird, completely out-of-place songs?” you wonder. 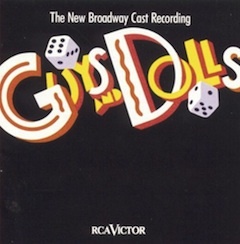 It becomes clear when you learn about “jukebox” musicals, where the whole thing is meant to celebrate the work of, or at least line the pockets of, one specific composer. This is why, for example, “White Christmas” is such a bum steer. It’s all Irving Berlin music. Fab composer, no lack of talent there…but by the time they got around to making this movie, the only Berlin songs left were the cuts of the cow that are normally put into hot dogs. It explains why two of the most talented singers of the 20th century had to be good sports and sing songs about about a the lack of aftercare in the military pension program, and one’s desire to use snow as a haircare product. And yet so many movies have pulled that kind of stuff off so well. “Shine On Your Shoes” is a song about the use of footwear maintenance services as a viable treatment protocol for stimulating dopamine pathways. You’d think that if the movie were going to use it at all, they’d stick it in the “musical within a musical,” where the cast can sing pretty much anything they want without having to justify it. But no…they found a way to make it serve a purpose in the story. All scenes in a story need to either define character or advance the plot. 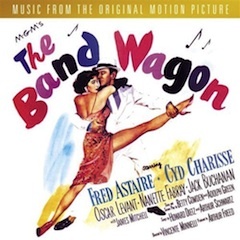 This song establishes Tony Hunter (Fred Astaire’s character) as a guy who’s capable of feeling genuine melancholy, but also of putting it in perspective and doing something about it. Don’t you feel foolish now? Thank you; it speaks well of your character that you now admit how wrong you were. Listen to “A Shine On Your Shoes” (from The Band Wagon) on the Amazon MP3 Store. As always, the above link is embedded with my Amazon Associates code. After you click it, every purchase you make during that Amazon session will result in my receiving a small kickback in the form of Amazon gift credits. I promise to spend them on wonderful and foolish things. Like an electric bicycle. But only if it turns out that Amazon doesn’t sell an electric unicycle. I’ve just checked iTunes and confirmed that there’s no musical genre for “Circus.” Which surprised me. Have you ever scrolled through that entire popup list? There’s even a genre for “Finance.” Really? What stylistic elements typify a good Finance song? 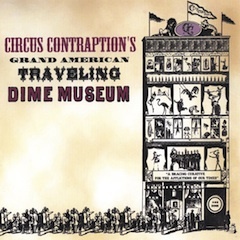 I started buying Circus Contraption tracks after watching a marathon Thanksgiving showing of the fantastic PBS multipart documentary about the Big Apple Circus. It’s a tremendously entertaining series…and all six hourlong episodes are online at the PBS website. Guess you feel pretty stupid right now, don’t you? The show has a cool soundtrack. I do wish that its signature theme (by The Features, a band that I hadn’t heard of before, but who I really, really like) were longer. It runs just a little over a minute. It’s not about the “Beats per measure per dollar,” you understand; it just seems like “Whatever Gets You By” has some real legs to it. I’ve had some of these tracks in my music library for a couple of weeks now, though, and I must caution you that they can be dangerous when they come up on shuffle play. You’re culturally-programmed to respond to this kind of music in a specific way. If you’re in the kitchen and a recipe calls for three eggs, then those eggs will be juggled on their way from the fridge to the mixing bowl. If you’re out taking your daily Constitutional and there’s anything narrow and linear on the ground along your path, you will hold out your arms for balance and walk across it like a tightrope. When you walk your dog at night and he finishes taking a whizz against a streetlamp, you will suddenly point to him there in the spotlight in a broad and flourish-ey sort of way, as though to encourage the audience to applaud his wonderful trick. It will happen. If this music comes on in your headphones and it doesn’t inspire you to behave as though you’re wearing something colorful and spangly and 300 people are hanging breathlessly on every graceful move you make, then something inside you has definitely gone dead. 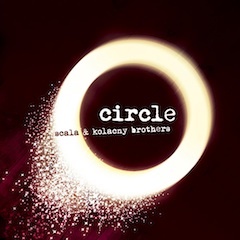 Listen to “Carousel” on the Amazon MP3 Store. As always, I remind you that my music links are embedded with my Amazon Associates code. If you click, any purchase you make during that Amazon session will result in my receiving a small kickback in the form of Amazon gift credits…which I will spend on fun and foolish things. This is probably the perfect time to slot in a song like this. It’s a modern recording of a Christmas classic, sung so very sweetly. Yes, it’s Kristin Chenoweth. Even when she’s singing an angry tune about throwing out a wretch of a boyfriend and vowing to never allow his presence to darken her thoughts ever again…it’s Sweetly Angry. As the boyfriend, you’d feel like it’s best to just pick up all of your clothes and books and CDs off of the front lawn, get them into the trunk of the car, retreat to Panera for a few hours and then circle back and try to fix the situation. Why is this weekend the exact right time to put this song into the lineup? Oh, I can give you three reasons. I can also slightly draw this introduction out, to make absolutely certain that the album artwork doesn’t interfere with the formatting of the list. It’s the first weekend after the Thanksgiving holiday, and many of us are probably spending some of this time tending to holiday advance-prep. I myself put a half-gallon of apple cider in the fridge the other day, anticipating that this would be the big weekend that I set up my Bachelor Tree. Not only is “I’ll Be Home For Christmas” a timeless Christmas classic, but it’s also a timely reminder to book your reservations early if you’re traveling over the holidays. It’s still three weeks before Christmas, and we haven’t yet begun that slow transition from Grinch Personality Mode to Cindy Lou Who Personality Mode. …Which means that I can cave in to my three-sizes-too-small sentiments and complain about these bastards at the record companies who know damned well that there’s only one good song on the CD, and cynically refuse to sell it to you online unless you buy the whole album. Yes, of course it was a terrible movie. What a question! It stars Danny DeVito and Matthew Broderick. And if this were the 80’s, that’d be terrific news. As-is, it’s not a warning per se but suffice to say that we will study the trailer carefully before making a buying decision. And oh, dear…there it is: the scene in which “Dad” is inside, or clinging on top of, an improbable and out-of-control vehicle or contraption, screaming and flying through the air. It’s such a common sign of an actor’s desperate need to begin Act Three of his career that I wonder if it doesn’t amount to a “suicide by cop” sort of tactic on the part of the actor or his agent. That is, he doesn’t have the courage to pull the trigger and end all pretensions of still being able to carry an entire movie by himself, so he has critics, audiences, and executives do it for him. Mark my words: ten years from now, there’ll be a movie trailer in which Johnny Depp will be seen riding an out-of-control rocket-propelled snowmobile over a snowbank and straight into a septic truck as his adorable kids look on. Sorry…let’s get back to this song. The “Deck The Halls” soundtrack CD consists of 13 holiday songs. Eight of them are forgettable. Four of the rest are nice, but they’re so familiar that if you want to hear them you hardly need to actually spend any money. You pretty much just need to stand near a speaker placed in any public spot where more than nine people are likely to gather. And then there’s Track 9: Kristin Chenoweth’s rendition of “O Holy Night.” It’s one of the loveliest versions I’ve ever heard. I’d buy it in a heartbeat. 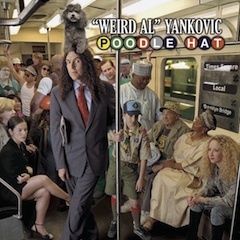 Ah: but it can only be purchased as part of the complete album. Friends, there have been times when I’ve gone into a transaction knowing full well that I was being rooked. That this was a badger game. That this company or individual’s entire business plan was based on the concept that they could indeed push around people like me — humble, hardworking men and women, who work the land with their bare hands and are responsible for putting the food on America’s tables — get away with it. Once, I ran out of gas on the highway, called AAA (if you’re a member, they’ll send a truck out free of charge), and then when the truck operator told me he didn’t have any change on him, I pretended to believe him…and that I was delighted to tip him $15 for the $5 worth of gas he’d just put in my car. Once, I bought an unlocked phone which, no matter how hard I tried, couldn’t connect to AT&T’s digital network. After lots of runaround with Customer Service, and ultimately speaking to an engineer who’d been working there so long that he had been there through two different corporate takeovers and renamings, I learned that the solution was simply to swap my original 16K SIM card for a new 64K one. When I got back in touch with Customer Service and they told me that they couldn’t give me a new SIM without putting me on a one-year contract, I was angry, and I told them that I might switch to another carrier over this, but ultimately I agreed to the new contract. But — my comrades — I cannot bring myself to allow the record industry to make me pay ten dollars for a song that should only cost $1.29, maximum. The line has been drawn…HERE. Listen to “I’ll Be Home For Christmas” on the Amazon MP3 Store. As usual, my Amazon Associates ID is embedded in that link. Anything you buy during that shopping session will result in a small kickback to me in the form of Amazon gift credits…which I will then spend on foolish and wonderful things.